I have always been the guy in our network analysis team responsible for the actual capture of network packets. I bought all the recording hardware we used, acquired network TAPs of all sorts and speeds, and did most of the planning of where to put which engine. One of the most complicated analysis jobs took two weeks to plan, and involved major headaches like SSL encrypted links, a load balancer, NAT devices and a huge VMware infrastructure. The VMware part was the biggest challenge of all, because we had to find a place where we could capture the traffic of three virtual machines running inside a DRS cluster, and we had to make sure we really didn’t miss anything coming or going to these servers. Later, when I was teaching Wireshark courses at Fast Lane, the topic of capturing the traffic of virtual machines came up every once in a while when I spoke about data capturing methodology in class. Since I’m also a certified VMware instructor it happened more than once that another instructor teaching the Wireshark class asked me how to do this, and sometimes even pulled me into his own class to speak about capturing virtual machines for a few minutes. And since that topic seems to become more and more popular I thought it would be a good idea to write a little how-to about it. Usually, the first thing I do when you try to capture packets to solve a problem I determine the best location to set up your sniffer. It can either be put close to the client, or to the server, or somewhere in the network path between the two nodes. Sometimes, I use more than one capture location, for example at the client and the server, at the same time. With purely physical networks the chances of selecting a good spot for the capture are pretty good – unless it is a very complex network with lots of redundancy and high speeds in the backbone. All you have to do is to find out which path the packets travel along and pick them up somewhere you like. Well, you need to determine if you can afford to use a SPAN port, or if you need to go by a TAP, but that’s usually it. 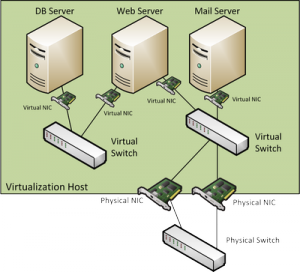 We could do a SPAN port on the physical switch, but we don’t know what physical link the mail server will actually use since there are multiple network cards connecting the virtual switch to the outside world. We’d have to capture both at the same time, and not all switches allow us to do that.But let’s say it does. We still have the problem that we copy frames from two full duplex links to an “output only” link, which means in worst case situations there would be 2 times 2 GBps copied to one link with just 1 GBps output capacity. Guess what? The switch will drop frames right, left and center on the SPAN session – and our capture box will not even notice. Notice that capture filters won’t help either, because the frames do not get that far in the first place. The second problem is that not all packets the Mailserver might receive or send travel through the physical link. It could communicate with the Web Server, and none of the packets would ever have to leave the virtual environment, and you’d never capture them. They would simply travel from one server via the virtual switch to the other server. Let’s make things worse. Let’s assume we have an enterprise level virtualization plattform running, which im my case would mean VMware vSphere. With vSphere, most big environments run clusters of virtualization hosts, and that cluster is usually DRS enabled. DRS stands for “Distributed Ressource Scheduler”, which is kind of a virtual machine load balancer: it can move machines from one physical box to another on it’s own, at least if it is running in fully automated mode. Guess what happens to our SPAN session from problem #1? As I demonstrated live on my Sharkfest talks twice the capture will just not see any more packets as soon as the mail server is moved away from the physical host. In the capture, it looks like the communication had been cut in a single instance. At the same time, the mail server keeps sending and receiving as if nothing ever happened, but on a different physical link. Ouch. It’s time for a little bet: I bet that you’ve thought about simply installing Wireshark on the mail server at least once so far. Easy, right? No fuss with SPAN, TAP, virtual environments and whatnot. Well, you’re right. But that “easy” way of capturing the mail server’s packets has serious flaws. I won’t go into much detail here, but capturing packets on the node in question is a pretty bad idea: depending on the server setup you’ll see ghosts like tons of CRC errors and huge over-sized frames. And that does not even include the fact that you’ve drastically changed your problem environment and risk system stability/performance while capturing. Virus scanner and personal firewalls may add further strange results, so – unless you really know what you’re doing – let’s forget about capturing packets directly on a node once and for all. It leads to the dark side! ;-) You can read more why local captures are a bad idea here. Okay, by now we know that capturing packets coming from or going to a virtual system most likely requires a new strategy. Somehow, we need to get our SPAN/TAP into the virtual environment, and if you’re searching the internet for this kind of thing you’ll probably find a couple of commercial product that will help you with that. And while they’re not bad I’d like to show you how to perform captures with what we already have, at least when running a VMware vSphere setup. I guess other virtual environments offer similar options but I haven’t worked with them yet, so I’ll stick to VMware here. You’ll notice that there are virtual machines on the left, and physical network cards on right right. There also is a so called “Port Group” called “Production”. All virtual machines have to be connected to a port group, and while some administrators think of it as simple VLAN groups they are more than just that. They are ports grouped together with a specific set of properties that we will take a closer look at soon. Now, let’s assume that Server1 and Server2 are talking to each other and we need to capture what is going on, for example by capturing all packets of Server1. Fortunately there is a vSwitch feature called “Promiscuous Mode”, which should sound familiar if you’ve already captured data before. But other than the promiscuous mode we know from ethernet NICs (which means that it accepts all frames that arrive instead of filtering on its MAC) the promiscuous mode of a vSwitch basically means that it will become a hub (well, sort of): it will forward all packets to all ports, which means that all virtual machines will see all packets of all other machines as well. It should be obvious why vSwitches are not in promiscuous mode by default – it floods VMs with traffic they don’t care about, and it allows rogue VMs to sniff packets they should not be able to sniff. Of course sniffing packets is what we want to do, so promiscuous mode seems to be the way to get them. The only problem is that when you just do that on the vSwitch your production VMs could all drown in packets, especially if you have not just a few VMs like in the test setup above, but maybe a couple of hundred. And that’s where port groups come in. Create a temporary port group with settings identical to the one Server1 is connected to. This means that you’ll have to make sure that the VLAN setting is exactly the same. 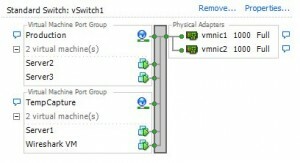 Move the Server1 VM to the temporary port group. Whenever I did this I in the past I did not lose any connection the server had at that moment – but of course I can’t guarantee that it won’t in your case. You’ll have to consider the amount of disk I/O that your capture VM will generate by writing packets to it’s VMDK, so please make sure that you don’t get into trouble with your storage administrators by putting additional load on their storage system. 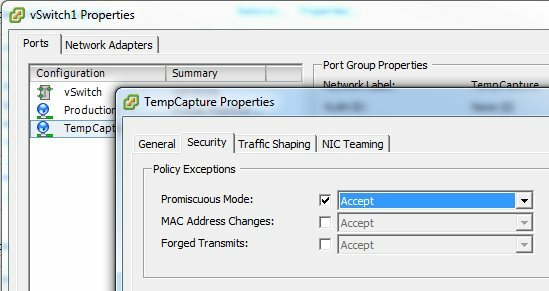 Very important: the capture of traffic using port group promiscuous mode only works if the capture VM is on the same ESXi host as the VM that you want to capture the traffic of. Otherwise you’ll only see broadcast/multicast packets. So you need to make sure that you move all VMs to the same ESXi host before you start the capture. Nice explanation, 1 question will vms within the port group with promiscuous mode turned on be able to recieve traffic from other port groups across the dvswitch i.e does the port group limit the traffic traffic sniffing ability to only that port group? Promiscuous traffic is limited to a port group, so VMs in another port group (even if also promiscuous) won’t see the traffic. How about within the same DVportgroup but on different ESX hosts? This does not seem to be working unless I move the VM to the same ESX host I tought DVpg and DVs was supposed to work access ESX hosts . Unfortunately not. The DV Switch provides connectivity across multiple ESXi instances for members of the same DVportgroup, but that doesn’t apply to the monitoring features. Regardless of using the promiscuous portgroup mode or port mirroring – the capture VM/device always needs to be on the same ESXi as the monitored VM. It’s really annoying sometimes, but I recommend using affinity rules when DRS is in play, to make sure that capture VM and monitored VM stay together on the same ESXi. Thank you jasper this is a verygood article i think am gonna stick around in your blog lol. question though . on the capturing machines if disable all protocols wouldn’t that be a problem ? wouldn’t you need at least TCP/IP to be enabled for the operating system to handle packets and pass it to wireshark ? Thanks! And no, you don’t need TCP/IP to record packets. 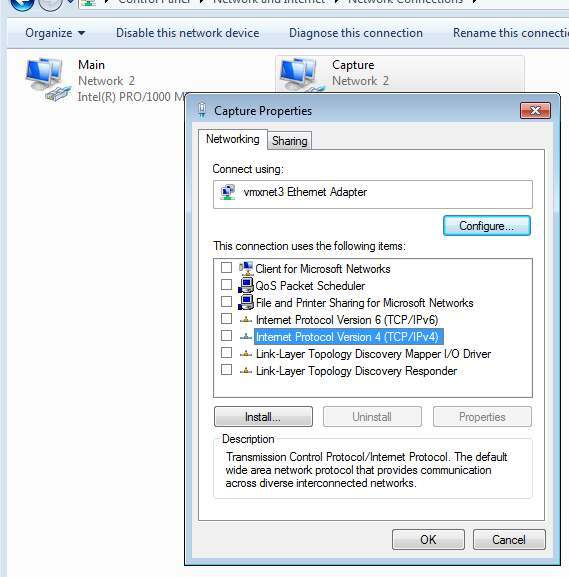 The WinPCAP or npcap driver picks them up and hands them to Wireshark even if there are no protocols bound to the network card. Here you mentioned monitoring only one VM, what is we want to capture all East-West Traffic and North-South in the virtual environment ? Should we put a VM which captures traffic in all ESXI hosts within the monitoring portgroup ?how to have a unified overview ? I’m not sure if it’s a good idea to try to monitor all VM traffic. In the end it depends on how much is going on – if you have only really small volumes of traffic you might be able to capture it all with one promiscuous switch or port group. But the aggregated traffic of all VMs may get you into trouble if it gets higher, so that’s why I usually don’t do somethign like this. If you want a unified overview (which sounds more like a metadata approach) you could try to leverage NetFlow instead. That’s either possible via a distributed vSwitch (if you have Enterprise Plus licensing), or using tools like ntopng in a VM that runs in a promiscuous port group.